This is just sickening and just makes you furious. The disabled vet in Texas who claimed that #BlackLivesMatter trashed and totaled his truck evidently lied. Cops caught on when they looked at the interview tapes. The first time Scott Lattin was interviewed, the damage was solely on the outside of his truck. When the second video was viewed, the glove box was torn out, the seats were slashed and the inside was a wreck. He may be charged with additional felonies, but for right now he’s being charged with filing a false police report. I’m sure they’ll get him on insurance fraud as well. There’s enough bad stuff going on out there with the likes of the #BlackLivesMatter movement, the New Black Panthers and the Nation of Islam, without making up false crap. This just makes the bad guys look like victims, which they are not. Shame on this man and his family. 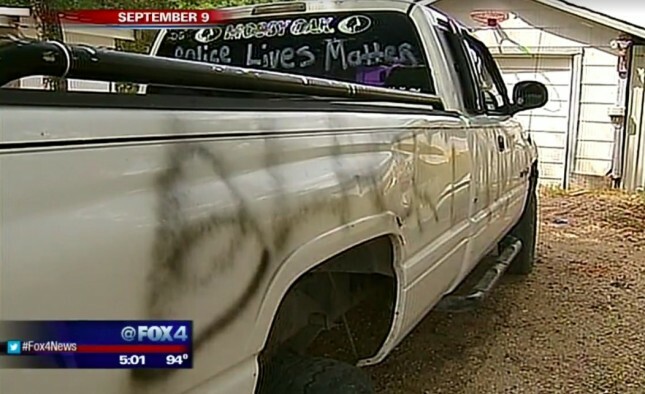 A Texas disabled vet who said he decorated his truck with pro-police messages only to find it damaged and vandalized with Black Lives Matter graffiti was arrested Friday for filing a false police report. “Very disturbing,” Whitney Police Chief Chris Bentley told KDFW-TV. Scott Lattin received quite a bit of media exposure after he made his claim last week — and that’s when cops got suspicious. For starters Bentley there was no damage inside the truck when police took their report — but when KDFW came to do the story, Lattin pointed out to the station that the glove box was ripped off and the seats were slashed. Lattin’s arrest warrant affidavit indicated he admitted damaging the inside of his pickup for insurance reasons, the station reported. Police could file additional charges, including felonies, against Lattin, and they aren’t looking for any other suspects, KDFW reported. What also bothers the police chief is that a GoFundMe account set up by a Lattin relative to cover truck repairs brought in almost $6,000. That GoFundMe page was disabled Saturday morning. “We have so many groups that have participated and come to Whitney, Texas, of all places to help these people — and for them to have been deceived?” Bently told KDFW. “It’s just wrong.” Car dealers and body shops even offered their services, the station added. Bently wants people to stop sending the family money and he’s working with the district attorney’s office to see how to get cash back to donors. “One of the social media pages said ‘My husband is an officer, I can give you $25 because that’s all I can afford.’ That just ripped at my heart,” Bentley said. Lattin’s neighbor Levonda Bradshaw told KDFW she was suspicious from the start because the family’s property is fenced in and their dogs bark whenever people approach it. Word began to spread quickly in the small town of about 2,000 residents of Lattin’s arrest. KDFW’s initial report featured Lattin’s 18-year-old son Jason, who said he wanted to become a police officer. But following his dad’s arrest, the station said neither he or his mother wanted to talk. People gave about $6,000 to this guy because they felt bad for him. Some of those were cop families who didn’t have the money to spare, but sent it anyway. I felt sorry for the guy too. The guy has a fence around his property with dogs, so the neighbors knew something wasn’t right. The police totally caught Lattin off-guard when they came for him. This takes lying to a whole new level. He must have really thought he’d get away with it. I’m sure the family was in trouble financially and he came up with this brilliant idea. Fail. And it’s an insult to all those out there that have been hurt or killed by these terrorist groups. People gave and gave to try and help the family. They believed them and never dreamed they would lie about such a thing. But they did. First, it breaks your heart… then you get very, very angry. I hope they throw the book at him over this.